The one-of-a-kind Rolls-Royce Phantom Coupé called ‘Royce’ that stars in the movie Johnny English Reborn will be at the IAA 2011 Rolls-Royce stand next week. None other than Rowan Atkinson himself will also be at the event after his unlucky McLaren F1 crash a few weeks ago. The petrol head will be talking to Rolls-Royce chief executive Torsten Müller-Ötvös at the press conference. The Rolls-Royce Phantom Coupé is not just a standard one, it’s a one-of-a-kind model, fitted with a 9.0 liter V16, as Rowan enthusiastically explained during his guest appearance on Top Gear earlier this year. When Rolls-Royce designed the Phantom, they originally had the 9.0 liter V16 in mind for it. Unfortunately that idea got canned but they still had three or four of those engines lying around. 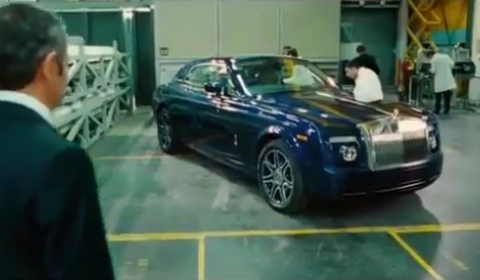 Rowan asked Rolls-Royce if he could use one of them for Johnny English Reborn and the engineers at Rolls obliged, making this Phantom Coupé truly an one-of-a-kind car.